In the days of old advertising was used to introduce people to new and innovative products by promoting their features. However, after the Mad Men era, advertising has turned into a huge ball of flaming half-truths that we have to figure out in order to know what we are about to purchase. While there are certain laws, advertisers still manage to provide us with miraculous products, which we end up not getting. Nevertheless, as we are all aware of the tricks of advertisers, we’ve thought ourselves to laugh at what should usually offend us. With that in mind here are 10 extremely funny and hilarious cases of false advertising. What a better place to spend your summer than this perfectly secluded beach. Well, it turns out that the beach is not as private as the ad makes you believe. 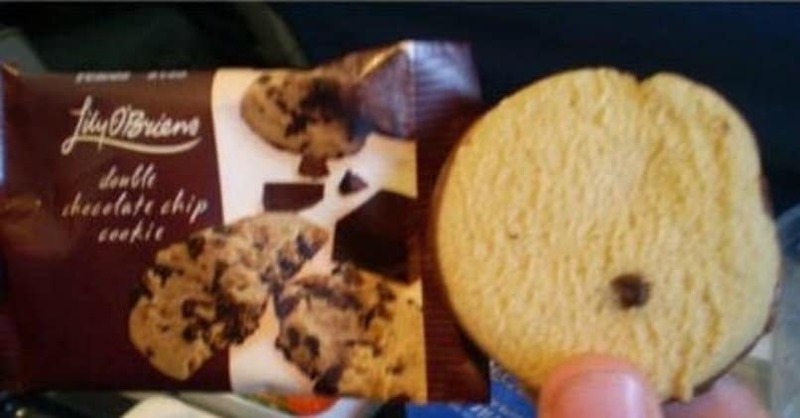 You might have been tempted by the filled with chocolate chips cookie on the wrapper, but it turns out that cookie has only one chocolate chip. After all it is called a chocolate chip cookie, not chips! 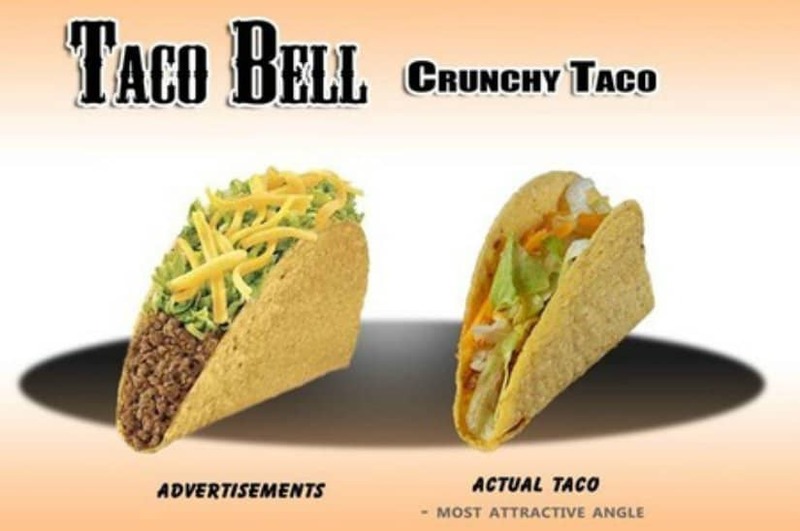 Isn’t the taco on the right just extremely tasty and good looking? Well it turns out that the Tacos from Taco Bell are not as attractive as advertised. Nevertheless, we still love them! You should be careful when buying a product based on the package. We are not sure whether the advertised pool is bigger than the actual one, or if the children in the ad are some sort of dwarfs, but we may never learn the truth. Isn’t the packaging of this German TV Dinner Box simply amazing? Well, you’d be surprised to learn that the contents are not as appealing. It seems like the fast food industry is quite deceiving. 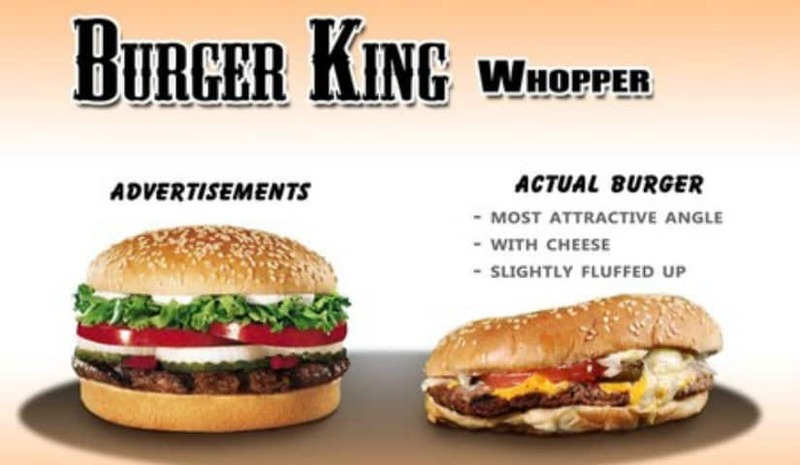 Not that we didn’t know that, but it is still funny to check out this Burger King ad-to-reality comparison. Another case of difference between the packaging of a kids water-slide pool and its real counterpart. Is it the perspective or is it just false advertising? If there is one lesson to be learned from these cases it is that you should always check out the size first! The tourist companies are quite deceiving as well. Look at how close to the Capitol this Hyatt hotel seems to be, when in reality, things are quite different. A Delicious Buffet At The Grand Palladium Bavaro? Isn’t this buffet at the Grand Palladium Bavaro simply delicious? Well, as we can learn from the real, not the advertised, photo, it seems that it is not! Tourist and advertising companies should definitely stop using so much Photoshop! Next time you plan your vacation, be sure to check out real photos from people from the location, as to not be deceived by the advertisers, as the people of the Ihilani resort at Koolina, Island of Ohau in Hawaii were!